The best of the timber has been cut for a distance of eight or ten miles from the water and to a much greater distance along the streams deep enough to float the logs. Railroads, too, have been built to fetch in the logs from the best bodies of timber otherwise inaccessible except at great cost. None of the ground, however, has been completely denuded. Most of the young trees have been left, together with the hemlocks and other trees undesirable in kind or in some way defective, so that the neighboring trees appear to have closed over the gaps make by the removal of the larger and better ones, maintaining the general continuity of the forest and leaving no sign on the sylvan sea, at least as seen from a distance. In felling the trees they cut them off usually at a height of six to twelve feet above the ground, so as to avoid cutting through the swollen base, where the diameter is so much greater. In order to reach this height the chopper cuts a notch about two inches wide and three or four deep and drives a board into it, on which he stands while at work. In case the first notch, cut as high as he can reach, is not high enough, he stands on the board that has been driven into the first notch and cuts another. Thus the axeman may often be seen at work standing eight or ten feet above the ground. If the tree is so large that with his long-handled axe the chopper is unable to reach to the farther side of it, then a second chopper is set to work, each cutting halfway across. And when the tree is about to fall, warned by the faint crackling of the strained fibers, they jump to the ground, and stand back out of danger from flying limbs, while the noble giant that had stood erect in glorious strength and beauty century after century, bows low at last and with gasp and groan and booming throb falls to earth. Then with long saws the trees are cut into logs of the required length, peeled, loaded upon wagons capable of carrying a weight of eight or ten tons, hauled by a long string of oxen to the nearest available stream or railroad, and floated or carried to the Sound. There the logs are gathered into booms and towed by steamers to the mills, where workmen with steel spikes in their boots leap lightly with easy poise from one to another and by means of long pike poles push them apart and, selecting such as are at the time required, push them to the foot of a chute and drive dogs into the ends, when they are speedily hauled in by the mill machinery alongside the saw carriage and placed and fixed in position. Then with sounds of greedy hissing and growling they are rushed back and forth like enormous shuttles, and in an incredibly short time they are lumber and are aboard the ships lying at the mill wharves. 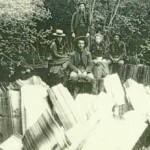 The mills of Puget sound and those of the redwood region of California are said to be the largest and most effective lumber-makers in the world. Tacoma alone claims to have eleven sawmills, and Seattle about as many; while at many other points on the Sound, where the conditions are particularly favorable, there are immense lumbering establishments, as at Ports Blakely, Madison, Discovery, Gamble, Ludlow, etc., with a capacity all together of over three million feet a day. John Muir commented that timber cutting in Washington had moved about eight miles from the coast and was slowly working its way to the hinterlands along the rivers which flow from the mountains. In the late 19th century, it was necessary to find a water route to the milling operation. After all, cutting down large trees that existed and hauling them out with a yoke of oxen was tedious and laborious work. Oxen might make four one-mile trips in any given day, managing to pull out only four of the monster trees of the era. Oxen cost $2-300 per yoke, making it financially difficult for logging operators to move a lot of timber to the mill unless rivers and streams were nearby. The question remained, how were the forests to be cut and moved on a large scale. Oxen were a bottleneck for production. Once the trees were milled horses and wagons were expensive to maintain and had limited carrying capacity. 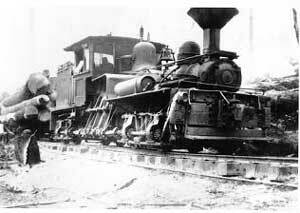 This would change with the arrival of the railroad and the invention and use of the steam donkey. The Northern Pacific railroad line across the prairie was consructed in 1873. The railroad would help spur the timber industry by linking the Yelm Prairie to the port of Tacoma and the outside world. This period, however, was a time of economic depression for the United States. Plus, it would take years for the new railroad to fully develop direct links to the east. 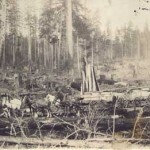 Consequently, Yelm’s timber era would begin in the last decade of the 19th century. Cedar shakes had been produced in this area for quite some time. Yet, like much of the region’s economic activity these were individual efforts tied to the barter economy. For example, William Tolmie was trading goods from the Puget Sound Farm to early Thurston county settlers who brought him their bundles of hand split shakes for payment. Decades later, beginning in the 1880’s cedar shake shingles became a much desired building commodity in the United States. By 1890, one third of the nation’s shingles were produced in Washington state. In 1892, over 6,000 train car loads of shingles left the state heading to markets in the east. Within four years this figure had doubled. Only 3.3 % of production stayed in the state, but Minnesota received 25%. Other leading importers of Washington shingles included the virtually treeless states of Iowa, Missouri, and Kansas. In 1899, 4.3 billion shingles were produced in Washington. That figure increased roughly 250% to 10.5 billion in 1905, the top year for production. 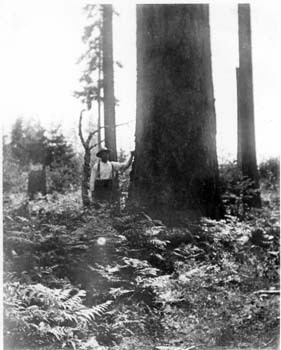 In the 1890’s the cedar forests along the Nisqually River were being cut for shake shingles. 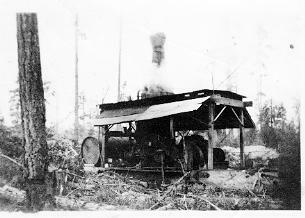 At least eight shingle bolt camps dotted the Nisqually primarily supplying the Card Shake Mill which was located roughly 2.5 miles up from the mouth of the river, approximately where old Highway 99 crosses the river today. This facility produced 150,000 shingles a day and operated from roughly 1892 to 1912. 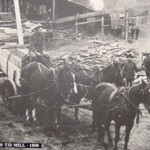 The first shingle mill in Yelm was the Shore and O’Dell operation. Shore and O’Dell was listed in the 1891-92 Washington, Oregon, and Idaho Gazetteer of business. 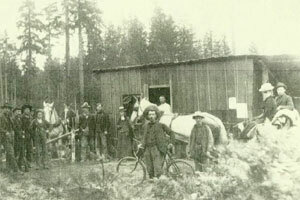 It was located on the Nisqually at “Baty’s” property. In later years the Pettit Mill, Castle Brothers, and Case Mill operated at this site, but whether or not they produced shingles is unclear. The Type Y shingle mill operated during the time period from 1908-32 and John Martin Solomon had a shingle mill on Pringle Rd. It also appears that Sam Rich operated a small shingle operation for several years in the 1920s. 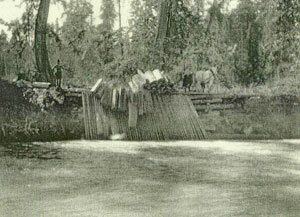 A log boom maintained by Rich caught the downstream floating bolts and was located in the portion of Nisqually River now by-passed by Centralia Power Canal and east of McKenna. A shingle operation involved a series of steps beginning with cutting cedar trees. 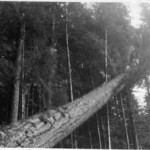 According to Yelm residents George McKenzie and Dow Hughes, who witnessed cedar bolt cutting, the loggers would cut down a cedar and then cut it into four foot long bolts. According to Willie Frank Sr., who cut bolts for the Card operation, it took 25 bolts to make a cord. The mill paid $2.50 per cord. A bill of sale from the Card mill for $400.00 meant 4,000 cedar bolts were delivered to that mill. Area residents remember there were a number of bolt camps on the Nisqually River in the Yelm area. Stella (Bennett) Peisner (b. 1900) remembered a camp across river from her Hart’s Lake home, on the property of Ross Chilson. Frank Bullard sent bolts down from where the Mashell River enters the Nisqually for a couple of years between 1890 and 1904. Another camp was near what is now the Centralia canal intake close to Hobson Rd. at what was then the Golding’s place. At these camps both whites and Indians worked for a $1 per day. Standing on spring boards they cut down the massive cedar trees which would then be sawed into bolts. Then, they were loaded on sleds pulledby horses and taken to a place where they were stacked or, in some cases, dumped directly into the river. One man recalled over a thousand cords being stacked along the river before being sent downstream. The bolts were shoved into the river, and Indians along the banks or in canoes prodded them out into the current with long poles. This was the beginning of the cedar bolt drive. For the remainder of the trip, Native Americans in canoes armed with pikes or poles followed the bolts downstream. In their shovel nose canoes they pushed and prodded bolts that had been waylaid by rocks or snags, especially at times of low water. Willie Frank Sr. testified in the 1970’s that he worked on these log drives. Walter Brezicha, a McKenna resident, related to interviewers that his older brother told him about shingle bolt drives as far north as their home near river mile 14, about one mile north of the Centralia power house. Harry Peterson recalled, as did Willie Frank, that as late as the 1950’s, people moved fence posts and cedar bolts down the river. 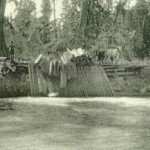 With the thousands of four foot long pieces of timber floating downstream the trick for the mill operator was to capture them on their way to Puget Sound. The Shore and O’Dell Mill probably had a log boom extending into the river to catch these bolts. It is unclear whether “Shore and O’Dell” had a conveyer in the early 1890’s to pull the bolts into the mill operation, but larger operations like the Card Mill used these to streamline operations. Once in the mill the bolts were sawed into fourteen inch lengths and trimmed. From here they proceeded to the final shingle cutting. Yesterday the writer was at the Nisqually River near its mouth, and found in the west fork a boom of logs extending from bank to bank and boom logs chained together holding this boom together so that a row boat could not get up and down the branch. Once again, it is unclear if these log accumulations were the result of commerce or nature. Certainly any attempts by Nisquallies to set up a fishing weir on the river would have been a target for these bolts and would have led to a cultural clash of economic interests on the river. This, however, is mere speculation. The ferries which existed on the streams might have also been delayed by such a herd of bolts floating by. An unsuccessful example of a bolt drive on the river was when Les Rice and Jim Mosman cut 16 foot lengths, split them, and made a raft. The plan was to float the raft down to a shake operation near McKenna. Unfortunately, there was nothing to stop the raft at that time and it continued down stream. 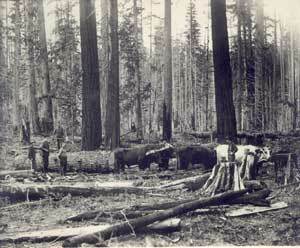 Economic expansion in the nation following Spanish-American War was a boon to the lumbermen of Washington. The price of douglas fir, which had been selling for $8.47 per thousand board feet in 1899, was up to $14.04 in 1907. The number of mills operating in the state increased from 317 in 1899 to 557 in 1905 and in 1907, before the “panic,” there were over 1000. 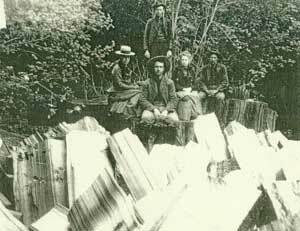 State records show that the Thurston County lumber industry of 1905-06 consisted of 19 sawmills and 14 shingle shake mills. 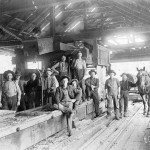 In Yelm in 1905-06, according to state records, the lumber mills were relatively small, the largest employed only 7 workers. Workers received $2.25 per day. Work was inconsistent and those lumbermen averaged only 15 days of work a month, which amounted to working 8 months year. 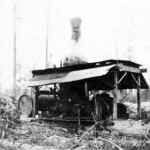 Lumber making was becoming increasingly concentrated in the hands of a few large operators who controlled vast expanses of forest and who could exploit these resources with rail lines. By 1900 85% of the lumber manufactured in Washington was produced by 12 percent of the mills in the state. 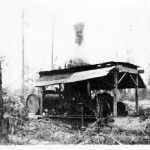 Two years later in 1907-08 there were three mills operating in Yelm. One mill had only recently opened and employed 12 men. The owners planned to offer their skilled employees a $3.75 daily wage for their ten hour shift. These were small operations capitalized with an investment of $3,500. Yet, total employment from these three operations was between 40 and 50 men. Employment patterns in the area were beginning to shift from farmer to laborer. These mills had the capacity to produce up to 10,000 board feet per day, but seldom reached that maximum level due to fluctuations in demand, mechanical difficulties in the mill, and the weather. 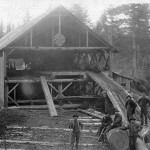 In 1908 a copy of The Coast listed the Mosman mill of Yelm as producing 15,000 board feet of lumber each day. By 1908, however, the U.S. had experienced the Panic of 1907 and demand for lumber dropped across the nation as recession set in. The lumber market was extremely volatile in the state of Washington. In 1906, 77,000 boxcar loads of lumber were shipped east, but in 1907 that amount had dropped to 17,000. The impact of higher railroad freight rates and the Panic of 1907 resulted in one half of the mills west of the Cascade Mountains being closed. The 1909 “Bureau of Labor Statistics of Manufactures” identified no mill activity in Yelm for the preceding year. The recession had struck Yelm. Men who worked in the mills as an adjunct to their farming now stayed home. 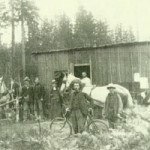 Single men who moved from town to town or logging camp to logging camp might have moved on in search of better times. Despite such setbacks Yelm had entered the lumber age. 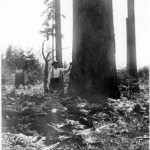 In the Oregon and Washington Gazetteer and Business Directory, between 1908 and 1932, the following timber related enterprises were listed for the Yelm area: Corbet and Moore, saw mill; Fox and Garstand, sawmill; G. E. Goodard, sawmill; Hammerschmith and Sons, lumber; W. S. Kelter, sawmill; George Lochead, sawmill; McKenna Lumber Company; Mosman Brothers, sawmill; Neat Brothers (Clifford and Roy Neat were killed in a donkey engine accident in 1917 in Kalama, brother Winston was injured), sawmill; Robinson Lumber Company, sawmill; Type Y Shingle Company; and Lee Vale, sawmill. Freight cars today hid a large part of Yelm from the Northern Pacific tracks, which run through this place. These cars, forming several trains, were being loaded with telegraph poles, piles, hewed ties and posts. All except the ties were products of the Whitlatch mill, Yelm’s main industrial plant, which cuts about 40,000 feet of lumber a day. The poles, piles, ties, and posts covered the ground for a block extending from the railroad tracks. 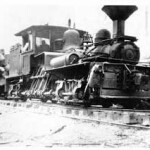 They were being loaded on the cars to be shipped to various points in Washington and Oregon, especially in this state, where railroad building is now causing greater exports from the sawmills. The railroad’s ties are hewed from timber that is cut down just outside Yelm and are hauled to the railroad station in big wagons, which are coming and going constantly. The ties are being brought in so fast that there was today a great pile of them awaiting shipment. The piles and telegraph poles are also being turned out by the mill workers faster than they can be handled by the railroad men, so that the first view of Yelm that the stranger gets is one that reminds him of a big lumber plant itself. Technology was changing the face of the timber industry. Steam donkeys, sometimes with steel cables reaching four miles, were able to pull logs more rapidly and at greater distances than the their yoked oxen predecessors. 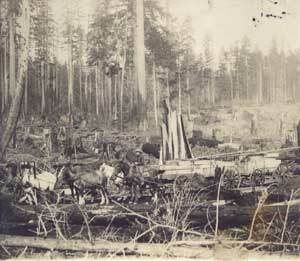 Logging railroads began winding their way into the forests around Yelm. 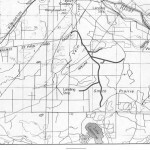 According to Logging Railroads of the West North Star Lumber Co. (1908-12) had 3 miles of tracks leading from the woods to the mill, as did the Lindburg and Shuh Logging Co. (1907-1908). Lindley and Sam Lawrence had a mill, around 1892, near the lake that now bears their name. Records show the Nordmeyer mill at the James Price place in the Bald Hills operating in 1896. The 1900 census, in contrast to earlier ones, listed several men as having lumber related jobs. John Nordmeyer, who at the time was boarding with Isaac Rathbun, identified himself as working at a sawmill. Also boarding at the Rathbun house was William Pringle. Both Pringle and Rathbun identified themselves as teamsters. Quite possibly there is a relationship between the mill where Nordmeyer worked and the teamster activities of Rathbun and Pringle. Later Rathbun would operate a mill on his property. Also, according to the Loutzenhiser book on Yelm, Henry Garstang operated a mill at this site. In the 1900 census Garstang was listed as living near the Rathbun home. In subsequent years the Portland, Locheed, and Faltner mills operated near what is now 93rd Avenue. Whether or not the men who identified themselves as “laborers” in 1900 worked at mills is unclear. Farmers may have been employed at the mills, but still considered themselves to be farmers. By 1910 the world of logging can be seen clearly through the eyes of the census taker. Previously a few residents had identified their occupations as being related to the timber industry. A variety of skilled and specialized jobs filled the occupation column of the census that year. Men worked as fellers, pole cutters, toploaders, super heaters, snipers (men who beveled the edges of logs in order to allow them to be pulled by a steam donkey more easily over any obstacles which might be in their path), and as laborers in the logging camps. One couple worked together in the camp, the wife served as a cook. The presence of the donkey engine was also reflected in this census. Earl Cook was a donkey engine fireman responsible for keeping the steam levels up in order to provide power. 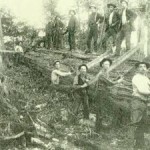 Logging railroad activity was on the rise. Chester Fleetwood was an fireman on one of the shay engines which hauled logs. Emery Whitlatch was listed as being a manager and owner of a lumber mill. Mill jobs were also identified in the census. 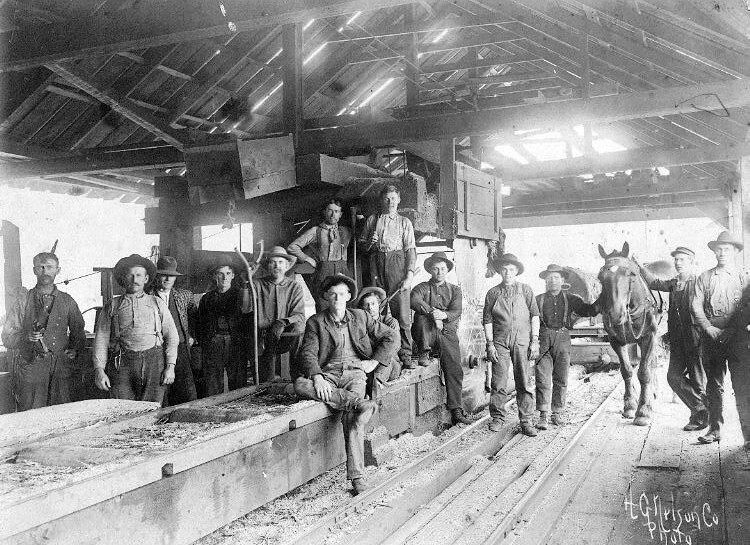 Machinists, millwrights, boilermakers, and planers were all found living in Yelm in 1910. Some of these men might have worked at the Salsich operation in McKenna under the leadership of Adam Cook. It was in the pre-World War I era that the largest mill operation in the Yelm vicinity got it’s start. The story, however, starts a few thousand miles to the east in the forests of the old “northwest.” From 1873-1900 180 billion feet of pine was cut in Wisconsin, Minnesota and Michigan. Having cut the most profitable trees first, companies were now cutting the forest leftovers. This meant an acre of timber in these states, on average, contained one fifth the amount of timber that an average acre in Washington state held. Standing timber, in Washington state, cost 92 cents per thousand board feet, but in Wisconsin the figure was over three dollars. $3.26. What this meant was that timber was fast disappearing and profits with it. 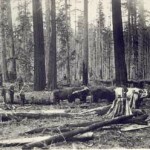 Lumbermen in the region began looking west to move their bases of operations beginning in the late 1880’s and continuing into the early twentieth century. The scale of their investment was incredible. Frederick Weyerhaeuser bought 900,000 acres of land. The St. Paul and Tacoma Company was capitalized for $1.5 million in 1888. Remember, records indicate that a Yelm mill at that time was capitalized for a mere $3,500. 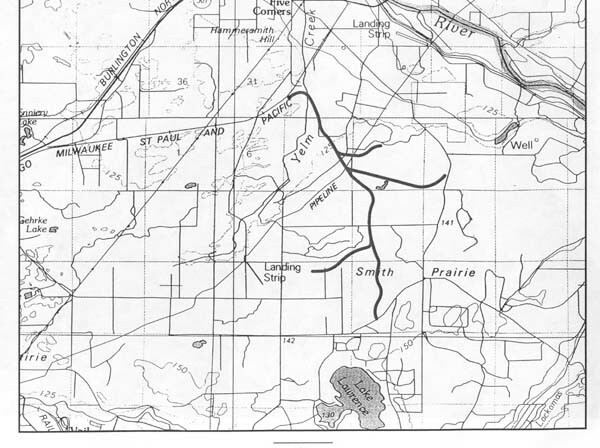 S. E. Salsich, of Heartland Wisconsin, purchased 26,000 acres along the Nisqually set about to invest over $350,000 in a massive complex along the river where the highway crossed into Pierce County. The mill would rely on railroads to bring the timber to McKenna from camps on both sides of the river. 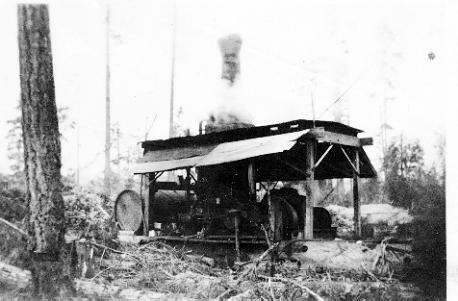 Eventually, 3 logging engines ran over 18 miles of railroad in order to fully exploit the neighboring forests. In contrast to some of the Yelm mills which might produce anywhere 5-40,000 board feet a day, the Salsich operation planned to produce 250,000 feet of lumber, 100,000 shingles, and 100,000 lath. The mill pond was intended to hold up to 5,000,000 board feet of logs at one time. McKenna, the site of the mill, was to be a company town. Salsich was going to provide housing, work, recreation, and stores for its’ employees. The town grew to the hundreds. The story of the mill will be told through the press clippings of the era, artifacts from the mill operation, and pictures. 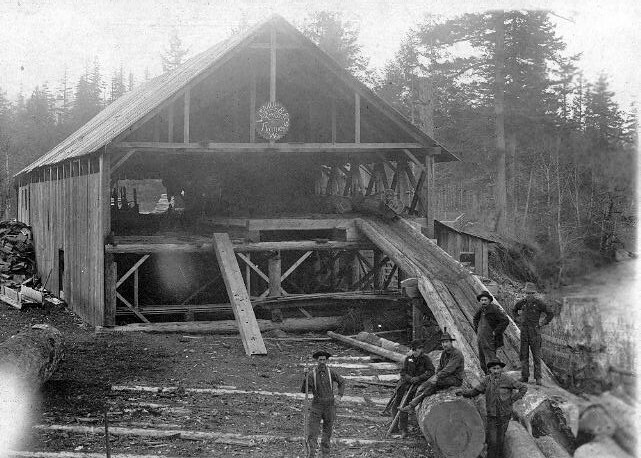 World War I (1914-18) spurred lumber production in the state and Yelm was no different. By the time of the 1920 census, nearly 25% of heads of households in the Yelm area identified themselves as having, in some way, jobs related to the timber industry. By then the McKenna mill was operating. Hammerschmith and Betchard had moved from their site in Roy to the Thurston County side of the river. Their mill employed 10-15 men in the woods and 15-20 workers at the mill on the hill that now bears the family name. A number of smaller mills still operated in the surrounding area. At the end of the war wages had dropped by 50% and production was at its lowest level since 1915. The recession, however, faded and from 1922-1927 there was a steady increase in production figures for the state. Near Yelm logging railroadscontinued to push their way into the woods. (With the release of the 1930 census more information about employment in the lumber industry will eventually be forthcoming). The boom of the latter half of the 1920s, however, was followed by America’s most serious depression. The worsening economy was not taken seriously at first. The American Lumberman when commenting on the panic of 1929 editorialized: “certain performances that recently have taken place in a rather limited area of the country and that have been participated in by a relatively small part of the population of the United States.” The “Wall Street Crash,” it was hoped would stay far away from Washington. Per capita consumption the nation of lumber fell from 7.3 bbf (billion board feet) in 1929 to 2.2 bbf in 1932. Logging payrolls dropped from $41-13 million between 1929-31. Wages in camps fell from an average of $5.80 to $3.11 per day. The number of mills operating in the state was reduced by half. [I] worked there until the mill closed down for a month on July 10, 1930. They told us they were shutting down for a month, and would call when they were ready to start up again. I’m still waiting to be called back to work. The struggle by lumbermen to keep their operations afloat with a contracted market, labor unrest, and the traditional hazards of milling (i.e. fire) is best exemplified by the story of the Martin Gruber and Ben Docherty. 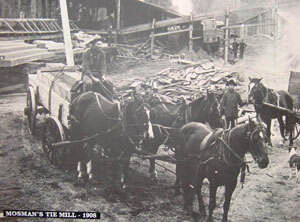 The Gruber and Docherty Mill moved to Yelm following a 1927 fire at their facility in Rainier. Buying out the Harstad Brothers (at the site of the present Mill Pond school) the operation employed around fifty people. Half worked in the woods, cutting trees and running the logging railroad. Once at their new site Ben Docherty laid out a five mile logging railroad which ran east across the Yelm-Rainier road, under the Northern Pacific tracks, and into timberland near the southern edge of what was then generously referred to as Solberg Lake. (At the edge of what is now the Yelm Golf Course). The other half were employed in, and around, the mill. to find a man who had the responsibility of getting work out of a group of men, as he did as superintendent in the woods, who was so universally liked and respected by those who he had working for them. To my knowledge, none of them ever spoke a word against him, which is quite a tribute for a boss of a logging crew. Another man commented that you didn’t work for Ben Docherty, you worked with him. 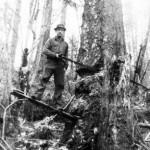 Ben Docherty retired in the 1930s for health reasons, but even his remarkable qualities could have saved the logging company operations from the problems it would soon face. With the onset of the depression production at the mill dropped considerably. Then fire struck in November 1931. A spark from a slab pile ignited a blaze which burned down the $40,000 mill. 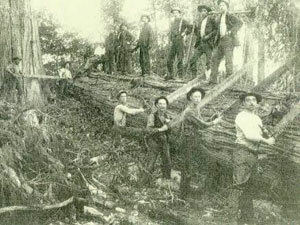 People fighting the fire, however, were able to protect the cut lumber (estimated at $20,000) that was ready for shipping. With insurance money and sales receipts from selling the saved lumber Gruber and Docherty announced that they planned to rebuild and reopen, soon. This amount of interests in labor will mean better times for a good many families who have had no work for a long time. All of the old employees that are available will be taken back as near as possible, according to Mr. Gruber. By now trucks were bringing in logs from as far away as Clear Lake and from across the Nisqually (near where the present day Whitewater Estates is located) to the mill south of Yelm. The latter trucks would have passed the shutdown McKenna Mill before dumping their loads in the mill pond. Then, in April 1935, a kerosene lantern was knocked over and a fire ignited. Before it was brought under control it had destroyed the company’s stock of 400-500,000 feet of lumber and a planing mill. This time, the main mill was saved. Ironically, had it stayed open it might have been the scene of picket lines by workers demanding more than their average 58 cents per hour wage. Gruber-Docherty was back on line by June 1936, as was Thurston Johnson’s mill, also south of town. The paper reported, as it must have done frequently during the thirties that, “Citizens of Yelm are mighty glad to see the mill going again as it was the only industrial payroll that is now located in Yelm.” Gruber, in his interview with the paper, stated that business conditions were getting better, but there was a worrisome “flat spot” in the market just then. Possibly Gruber noticed economic trends which signaled the beginnings of the 1937 recession. As the New Deal moved into its second term the economy worsened and unemployment increased once again. In 1937, unable to turn a profit, Gruber-Docherty was closed for a last time. The timber business was tough on people. Spinning saws, open pulleys, massive trees falling, steam and fire, all contributed to a high accident rate for workers in the industry. The following are a sampling of those accidents. described the following accident in letter home to his mother in Toledo, Ohio. I don’t know how the weather is there but it is pretty cold here today. Last night about four o’clock it began to get cold and it snowed some about six o’clock. It froze the small puddles of water and today the ground is froze and there is enough snow to make the ground white. And just yesterday they were bragging of still picking strawberries. We just lost two of our men yesterday thru an accident at the mill. The boiler room and engine room are in a separate building from the mill and I was working on the second floor of the mill helping on repair work when something sounded like an explosion in the boiler room and we all ran down there and the place was all full of steam. One of the firemen came crawling out on his hands and knees thru the boiling water and we could hear another man calling for help back in the building. They got a fire hose and run cold water into the water on the floor and the Supt. ran in and got the other man out. It sure took a lot of nerve to go in there as the steam was roaring and you couldn’t see a thing but he went in and found the man under a pile of slab wood and dragged him out. Then he shut off the main steam line and flooded the fires under the boilers. A six inch steam pipe had broken and threw a six inch stream of steam and boiling water all over the two firemen. It had a pressure of 160 pounds and was strong enough that it tore a big pump all to pieces. One man was an old Indian about 55 years old and he was just a mass of loose flesh from head to foot but he never let out a sound. He stood and talked with us until the ambulance came and when they wanted to put him on a stretcher he said “no, I’ll walk over” and he did. The other man was a white man and he fainted after he reached the cold air. He died last night as he sat in the boiling water for a couple of minutes until the Supt. carried him out. The Indian died this morning. He was just married this month, too. The white man was about forty years old and had a wife and six children. 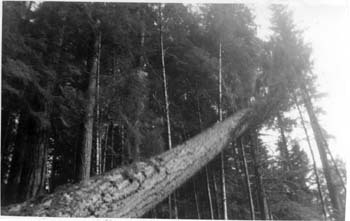 In the thirties the Nisqually Valley news would carry front page articles describing timber industry accidents. Franklin King had the misfortune to fall while working in the woods, Monday, tearing loose a couple of ribs. The injury, while very painful for a day, was not serious. At the last report he was mending rapidly. Sterly Philby had the misfortune to get his left hand badly mangled in a wood saw about nine o’clock Thursday morning. Dr. Pool gave first aid and then J. M. Curry took him to the Great Northern Hospital in Seattle. Nevertheless, the observer coming up the Sound sees not nor hears anything of this fierce storm of steel that is devouring the forests, save perhaps the shriek of some whistle or the columns of smoke that mark the position of the mills. All else seems as serene and unscathed as the silent watching mountains. When one considers [that . . . they require no stable and no feed, that all expense stops when the whistle blows, no one killed and teams to winter, no ground too wet, no hill too steep, it is easy to see they are a revolution in logging. The new technology was faster and far more intrusive. The land itself was torn up as steam donkeys, according to a 1902 description, drew logs “up through the forest, threshing and beating and groaning, tearing up small trees and plowing great furrows in the earth.” Young-growth and lesser valued trees that would have been left under older logging methods were destroyed, reducing the potential for natural reseeding in cut-over areas. Clear cutting not only destroyed “worthless” species but furthered ecological disruption by opening adjacent forest stands to windthrow and facilitating nitrogen and phosphorous losses from the soil. The increasing amount of slash and debris left on the ground recycled nutrients back into the soil, protected soil, and aided wildlife habitat, but it also fueled an increase in frequency and intensity of fire. Those fires then changed the species make-up of the forest and adversely affected smaller animals. Short term profits brought long term consequences. Soil erosion from cut-over areas silted streams and affected fish and aquatic life. Without the deep root systems of trees, streamside embankments were particularly subject to under cutting. moreover, without the protective cover of streamside trees, water temperatures rose, harming the fish population. Fire was another problem, both intentional and unintentional. Logging leaves an extraordinary amount of debris. Severed limbs, mounds of drying needles., wood chips, and crushed undergrowth contributed to mountains of slash replacing the former forests of fir, hemlock, and cedar. Those who wanted to convert this logged off land to farming purposes the slash had to be burned. Smoke from slash fires, traditionally conducted in February and October, punctuated the horizon. Once the slash was burned farmers would sew rye, timothy, or clover to provide feed for grazing animals. Pastures, dotted with the charred remains of stumps, now would now help provide a source of income for Yelm property owners. 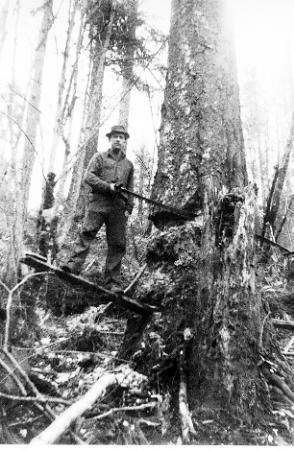 This story only takes Yelm’s logging history up through the 1930s. Future additions will focus on the Yelm connection to the in the Weyerhaeuser forests at Vail and the small scale gyppo operations which exploited local woodlots into the 1970s.